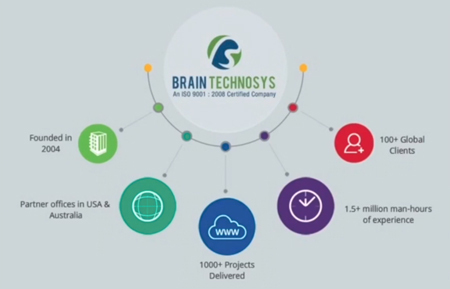 Brain Technosys provide a full service digital marketing services in India. For over 14 years we have helped clients grow online, so if you want to realize your digital potential. We design and implement digital marketing campaigns that deliver business goals across, channels, markets, and platforms. Brain Technosys is capable of implementing a full suite of digital marketing solutions. We will work with you to determine which tactics are best-suited to help your business accomplish its goals. We drive your business success value through our digital marketing solutions. our solutions are based on a deep understanding of your goals, environment, business model and customers. we deliver impressive campaigns through an integration of SEO, design & development, content creation, and social media. We implement search strategies to drive volume relevant traffic to your website and use intuitive tools to reveal who your visitors are, what they are doing and use this information to drive optimal conversions. We have a great team with us based in India. Our fantastic in-house technology helps us deliver bespoke and cost-effective solutions for all of our clients. As a full digital marketing service provider, our end goal and the main focus is on generating an impressive ROI for our online clients. Our business is powered by people and we are now reaching more people than ever before. We focus on your business and help you develop it further through the most effective SEO services. Our SEO packages are great for all the businesses looking to optimize their web presence. ORM services can help you by pushing down unpleasant results in search rankings and bringing up positive results. Being a leading Social Media Marketing Service provider, we always focus on customer engagement. As per SMO metholodogy, these packages have been designed keeping in mind the social media needs of businesses. We specialize in Facebook marketing for your business growth. Our strategy can assist you in getting high returns. Our expert teams are well trained and experienced enough to optimize the success of your PPC campaign. Our PPC management packages are designed to help your business grow by maximizing the return on investment. Why should You Choose Us Over Others? Brain Technosys Pvt. Ltd. is a 14 years old well-established company with ISO Certification, Microsoft Silver Partner & Nasscom Member. We have over 1.5 million man-hrs of experience and have successfully executed 5000+ Web, Mobile Apps Jobs and digital marketing. 14 years old well-established company with ISO Certification. Over 1.5 million man-hrs of experience. We understand customer concerns and know how to address them with good quality and on-time delivery. We offer tailor-made engagement models, to meet the exact requirements of clients. We offer best in class solutions at the most competitive prices.